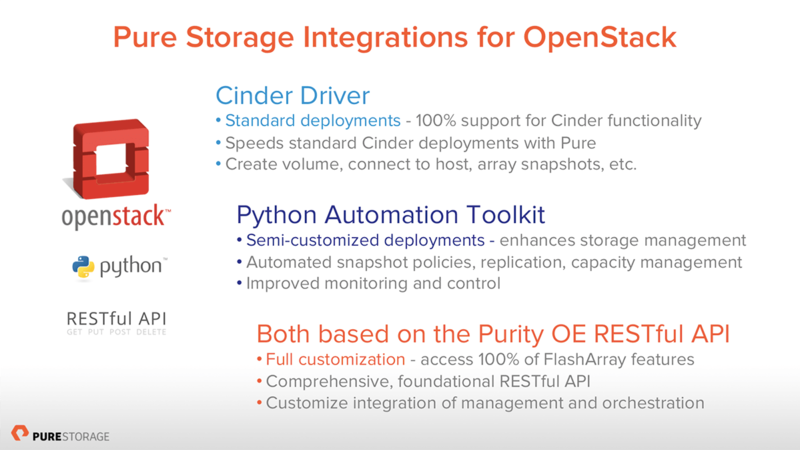 Today Pure Storage announced joining the OpenStack® Foundation as a corporate sponsor and contributor and the immediate availability of an updated Cinder Driver and a Python Automation Toolkit. The time feels right for Pure to increase our investments in OpenStack and commitments to the open source community. With heterogeneous support for hypervisor platforms and a number of commercial distributions including Cisco, EMC, Red Hat and VMware, I think its fair to say the market views OpenStack as the leader in cloud infrastructure automation. 1. Corporate sponsorship, where we will contribute to the code base including be it to the core, Cinder, Glance, Heat, etc. We will certify all upstream work and have already provided a number of contributions, including several to the core Cinder code. 2. A major update to the Pure Cinder driver with support for iSCSI and is included in the Juno distribution. The driver supports OpenStack Juno and Ice House releases and Purity O.E. 3.4.2 and later. The driver calls the Purity REST APIs to provide volume services (create, delete, attach, detach, extend), snapshot services (create, delete, list), create volume services (from snapshot, image, clone, volume) and volume migration. 3. The release of the Python Automation Toolkit for Purity O.E. to augments the functionality of the Cinder driver with features like scheduling FlashProtect snapshots and replication, and storage monitoring and reporting services. The toolkit provides for the execution of Purity REST APIs with Python 2.6 or later. This version or higher is commonly found in major distributions form Red Hat, SuSe and Ubuntu. I’m very excited about the Juno release and Pure’s integrations. I’m working on the upcoming Storage Field Day 6, but will work get a demo online as soon as possible.